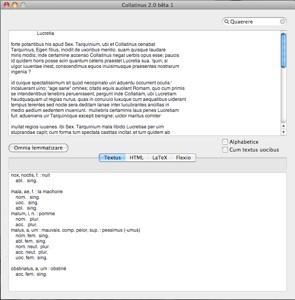 Collatinus is a software created and developed for Windows and Linux platform by Yves Ouvrard. The current version is version X. This software under GPL licence allows to prepare vocabulary for translation from latin. Its the essential tool for latin teachers in order to prepare their lessons and for students to help them to translate latin texts. A Mac port was released in 2004 by Frédéric Ferré (see In fx Venenum website). Unfortunately, this Mac version hasn’t follow his PC sister’s evolution and is no more compatible with MacOS 10.7 (Lion). In order to translate a word, please double click on it or click on the button “omnia lemmatizare” to translate all the words of the text. ✦ No duplicates when the translations are shown in alphabetical order. ✦ Creation of help in french and english. ✦ Addition of tooltips in french and english. ✦ Creation (based on version 8 of Collatinus for Windows). 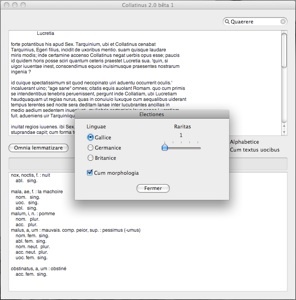 The 10.2 official version of Callatinus is now available on Windows, Mac et Linux platforms. Our 3.1 version will remain available beside the official version, even if this one is more complete (dictionnaries not only in french).